“Y2K is a crisis without precedence in human history.” – Byte magazine editor Edmund DeJesus, 1998. Does anyone have friends or family that caught the Y2K bug? I certainly had some family members that did. They filled their cars with gasoline on 12/31/1999 and stockpiled water and months of army-ration-style food. Although they were able to still use the water after January 1st, 2000, they could never stomach the food. So happily, Y2k ended up being a non-event. Indeed, these family members, and countless others, simply ended up being quite surprised. This past year showed again how difficult it is to predict the future, at least in the land of finance. For our 4th quarter commentary, I discuss what I consider five big surprises from 2017. 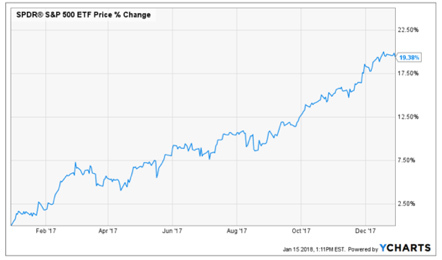 For 2018, many analysts are forecasting modest gains in the US stock market. Interestingly, for many of the international markets, about 10% of the total return came from a falling dollar. Looking forward, even after these enormous returns, international stocks are still more favorably valued than US stocks. 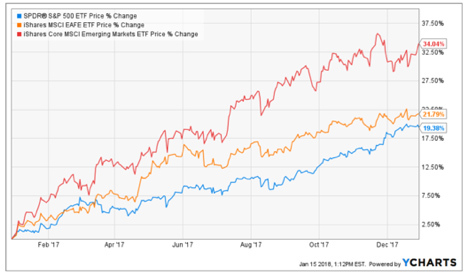 In a low interest rate environment, as we have now, PE ratios should be higher, as a PE ratio takes into consideration the present value of earnings, which increase as rates decrease, ceteris paribus. 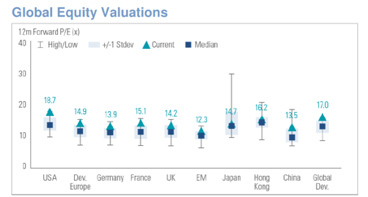 Currently, as can be seen in the below chart, the US stocks are the most highly valued market compared to stock markets outside the US, according to the forward PE ratio. Therefore, international stocks are forecast to have higher returns than US stocks for 2018. Most everyone forecasted that bond yields would go up this year. Instead, as can be seen by the below chart, yields on the 10-year government bond simply bounced around for the year and ended about where they started at, close to 2.5%. In fact, for more than five years now this pattern has continued every single year, and every year it has surprised analysts who thought for certain the 10-year yield would go up that year. The 10-year yield is foreacast to go up again this year. Towards the end of 2017, everyone seemed to become interested in cryptocurrency, the most famous of these currencies being Bitcoin. There is nothing like sizzling returns to generate a lot of excitement. 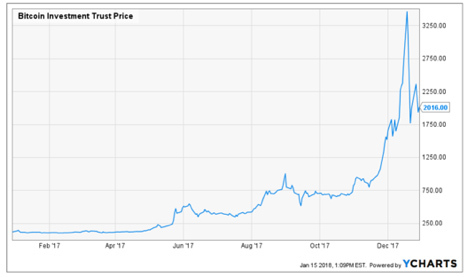 And this is just what happened with Bitcoin: the past few months of the year Bitcoin more than quadrupled from about $750 to about $3,300, as measured by the Bitcoin investment trust price. But then Bitcoin fell about 40% in value (see below chart). It appears that lately hedge funds have been shorting Bitcoin and small individual investors have been buying it. I’ve also been in discussions with our managed futures managers, who invest in established currencies, and none of them are investing in Bitcoin at this point since it is not liquid enough and considered too speculative. Who knows where this will end. However, what I do know is that while there is some genuine economic potential to a digital currency, there are many potential problems. These include facing a complete collapse of the currency, having it stolen without recourse, and supporting criminal activity. I’m currently writing an article on this topic, as it is rather complex, so stay tuned! Bitcoin is forecasted by some to continue to climb by leaps and bounds and others are forecasting it to crash. Few believed Congress would be able to get signed into law a new tax bill by the end of 2018, but it did. The new sweeping tax law is the largest, some say, since the 1980’s under Reagan. The new law is also idiosyncratic. For a typical taxpayer, it is not trivial to figure out the net effect of the tax law. In theory, high, medium or low income tax payers can all see an increase or decrease in taxes. We already sent a yearend note on some opportunities to take advantage for 2017. For 2018, we will be working with you and your tax professional to maximize the new opportunities as they relate to your own unique situation. Meanwhile, corporations on whole have experienced a significant tax decrease. 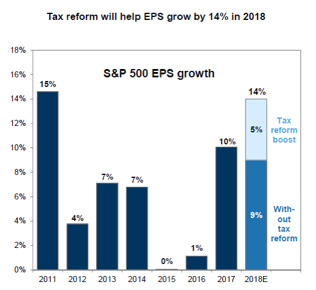 In fact, as the chart below reports, earnings are now estimated to increase over 50% this year as a result of the new law. Companies are expected to use some of this money to buy back shares and pay investors more cash in the form of dividends. Also expected is increased investment that should increase long run economic growth. Finally, some companies, such as ATT, Boeing, Comcast, and Walmart, are giving some of the savings to their workers in the forms of increased wages and bonuses. This should also further help the economy through the so-called macroeconomic multiplier effect. 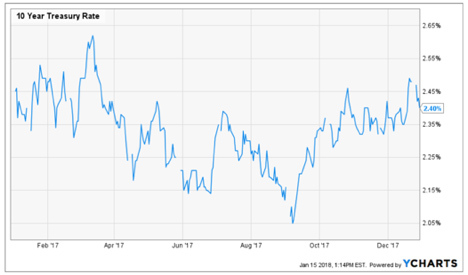 Not surprisingly, because of all of these expected positive effects from the new tax law, the US stock market was gyrating up and down based on expected passage of the new law. Once it was finally passed, US stocks enjoyed another large jump in value. So what else is in store for us in 2018? After 23 years in this field the only thing that would surprise me would be if there were no surprises! The good news is that our clients are not betting their financial well-being on a primary asset class or economic outcome or factor. Instead, we embrace a States of the World® wealth management approach that spreads wealth across myriad more factors than a conventional stock/ bond approach. As always, should you have any questions or concerns, don’t hesitate to contact your Omega Wealth Advisor. Above all, we wish you and your family a happy, healthy, and prosperous 2018! This commentary reflects the personal opinions, viewpoints and analyses of the Omega Financial Group, LLC employees providing such comments, and should not be regarded as a description of advisory services provided by Omega Financial Group, LLC or performance returns of any Omega Financial Group, LLC Investments client. The views reflected in the commentary are subject to change at any time without notice. Nothing in this commentary constitutes investment advice, performance data or any recommendation that any particular security, portfolio of securities, transaction or investment strategy is suitable for any specific person. Any mention of a particular security and related performance data is not a recommendation to buy or sell that security. Omega Financial Group, LLC manages its clients’ accounts using a variety of investment techniques and strategies, which are not necessarily discussed in the commentary. Investments in securities involve the risk of loss. Past performance is no guarantee of future results.